Falling Into Place is an unflinching look into human nature, the many ways we can and do hurt one another and how one girl, Liz Emerson, doesn't know how to break the vicious cycle she's fallen into. The only solution she can come up with is to drive her car off the road in an attempt to end it all. This is how we meet Liz, when she's at her breaking point. From there, the book flashes between the moments before the crash, the present and snapshots of Liz's childhood with a mysterious narrator. The story is simultaneously fast (I read it in less than a day) and slow. Slow because each chapter seems to peel away another layer of Liz and the people in her life. At first glance, it's easy to think you've got these characters figured out. Popular girls who are mean because they can, lie because they can, drink and party and think of no one but themselves. And Liz was at the center of it all as the most popular girl. But then, we see how much her best friends mean to her. The dynamic between the three girls was probably my favorite part. Yes, they weren't always kind or good to each other and there were so many things they should've talked about. But at the same time, I could feel through the author's words that they also loved each other. That they had fun and had each other's backs. Friendships are so complicated and this book did a good job of portraying that dynamic. I wished there had been more of it. More than two point-of-views are tough for me unless it's in a series and I've already had time to get to know the characters. 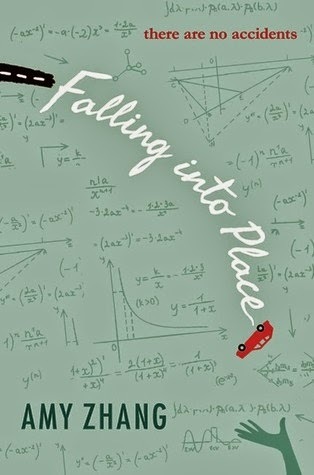 In Falling Into Place, we see what's going on with multiple characters - Liz, her best friends, the mother, a classmate who is in love with Liz - all told by an unknown narrator. And these glimpses are frequent but fleeting. So while it did reveal more of what Liz hid beneath the surface, I never truly felt connected to her or her friends. It left me wanting more. At the same time, I recognize that the author chose this specific storytelling style and I do admire what she did here, especially with the unique narration. I just don't think it was for me but I see why so many people have rated this book highly. I do! I think it's one of those books where it's hard for me to give a definitive answer because how much you enjoy the storytelling will really depend on your preference. So check it out and decide for yourself! Ah, Falling into Place. I'm still not sure how I feel about this book! I did like that it was quite an exploration into the character of Liz Emerson, but it was also a wee bit disjointed and didn't flow quite as well as I'd have liked.